The gorgeous, intense color of the London blue topaz really stands out in this London blue topaz diamond trinity ring in 14K white gold from Apples of Gold Jewelry. The six diamonds in this ring total 0.18 carats, and are rated G-H for color and SI1-SI2 for clarity. In the center of the diamonds lies a beautiful, authentic London Blue topaz gemstone, which is 7 by 5mm in size, and cut into an oval-cut shape. The London blue topaz stone is AA rated, and the contrasting look of the blue against the white gold is something to behold! The interesting prong work on the setting of this ring gives an almost crown-like appearance to the stone and diamonds. 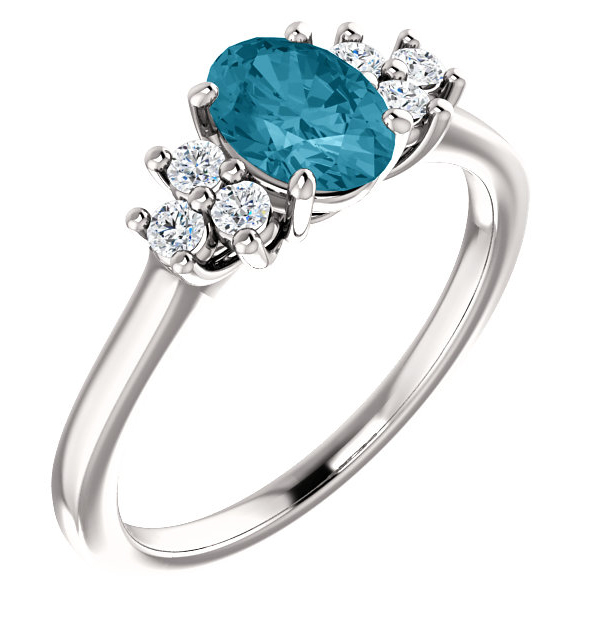 We guarantee our London Blue Topaz Diamond Trinity Ring to be high quality, authentic jewelry, as described above.